The California Vehicle Code addresses many alcohol related driving offenses in addition to DUI under California Vehicle Code Section 23152(a) VC and California Vehicle Code Section 23152(b) VC. One of these is California Vehicle Code Section 23222(a) VC, which makes it illegal to possess an open container of alcohol while driving. While driving, the defendant had in his or her possession or on his or her person any bottle, can, or other receptacle containing an alcoholic beverage which was opened, had a broken seal or had the contents partially removed. Under this statute, a highway is any public road or street, and not only the freeway. Under California Vehicle Code Section 23229 VC, passengers or drivers in a bus, taxi, limousine or camper are exempt from open container prohibitions, unless there are minors under 21 in the vehicle. In addition, a person may store an open container of alcohol in a trunk. If the car does not have a trunk, a person is allowed to keep an open container in an area where people usually do not ride (such as the bed of a pickup truck) or in a locked container. 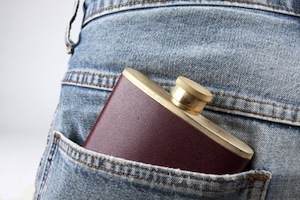 A man brings a flask of whiskey to a sporting event and drinks sparingly over the course of the game. At the end of the game, the man has consumed so little of the whiskey that he decides to drive home. While driving home, the man keeps the flask in his pocket. The man is stopped by police for an equipment violation and the officer notices the flask jutting out of the man’s pocket. The officer conducts a series of field sobriety tests, including the PAS test, and determines that the man is not driving under the influence of alcohol. However, the man could be cited for possessing an open container while driving because the flask was on his person. In another example, a group of friends rent a limousine for the night. While in the limo, the driver serves champagne and other alcoholic beverages. As long everyone is over 21, neither the driver nor any members of the group could be cited for possessing an open container while driving because limousines are exempt under California Vehicle Code Section 23229 VC. As discussed above, if the defendant was a passenger in an exempt vehicle, such as a bus, taxi, limousine or camper, he or she would be exempt from California Vehicle Code Section 23222(a) VC. Additionally, if the alcohol was kept in the trunk or other similar area, that defendant would not be guilty of this offense. For those who are 21 and over, possessing an open container while driving is an infraction that is punishable by a $250 fine in addition to court fees and penalty assessments. The total may ultimately exceed $1,000. Drivers under the age of 21 can be charged with the misdemeanor offense of possession of alcohol in a vehicle while under 21 in violation of California Vehicle Code Section 23224 VC. If convicted the defendant could be sentenced to up to six months in jail and a $1,000 court fine. If you have been cited for possessing an open container while driving, you need to meet with a Los Angeles DUI Attorney as soon as possible. As a former Deputy District Attorney with over 14 years of prosecutorial experience, Los Angeles DUI Lawyer Michael Kraut is highly skilled at defending clients charged with alcohol related driving offenses. Mr. Kraut knows how to effectively defend his clients charged with offenses like this. For more information about possessing an open container while driving, and to schedule your free consultation, contact Los Angeles DUI Lawyer Michael Kraut at the Kraut Law Group located at 6255 Sunset Boulevard, Suite 1480, Los Angeles, CA 90028. Mr. Kraut can be reached 24/7 at 888-334-6344 or 323-464-6453.